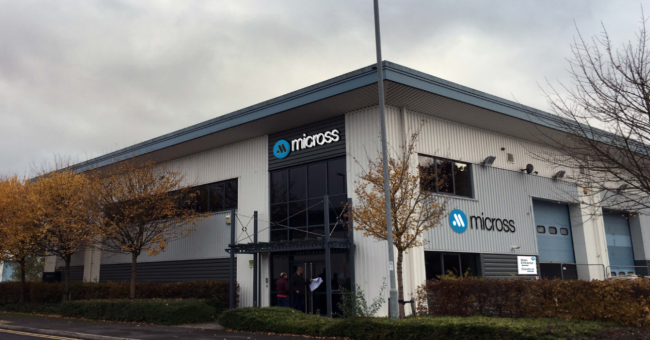 U.S. headquartered Micross Components has expanded its specialised UK manufacturing operation in Crewe to make way for new bespoke clean-rooms and an increase in business. The high-reliability semiconductor supplier has moved from its historic base in Crewe, to a new purpose built state of the art facility, doubling its floor space to 14,000 sq. ft. and retaining 35 highly skilled jobs. The new unit will enable Micross to accelerate its expansion plans and continue the impressive growth experienced over the last three years. Micross Crewe provides modified semiconductor components for a range of markets including aerospace, defence, industrial medical and space sectors, including both the European Space Agency (ESA) and NASA. The firm’s high-reliability semiconductors are specially designed to perform under the extreme conditions associated with space travel with Micross components having been used on more than 100 successful space missions to date. The new 14,000sq/ft unit was officially opened by Micross Chairman, Victor Vescovo who flew in from their HQ in Florida. The new site in Crewe specialises in Hi-Rel semiconductor component modifications for Space, aerospace and defence markets. Offering bespoke solutions to high tech industry problems. Using a highly skilled workforce and years of experience whilst also investing in the future with STEM graduates and sector-experienced specialists. Site General Manager Phil Worthington added: “This is a very exciting time to be part of the Micross group. Significant investment has been made to ensure the future of the business. Having a state of the art facility will allow us to give greater service to our customers and hopefully help win more business”.